We’re celebrating a major victory in our fight to protect animal welfare and food safety, Filene! The U.S. District Court for the District of Idaho ruled yesterday that Idaho’s “Ag-Gag” law is unconstitutional, overturning the law in a landmark victory for free speech, animal welfare, and food safety! We are all vulnerable when unjustly stripped of the right to bear witness and expose illegal and unethical behavior going on in industrial animal agriculture, one of the nation’s most powerful industries. This ruling affirms our right to report such abuse in order to protect animals and our health. While Ag-Gag laws are overwhelmingly opposed by the public, and nationwide thirty-two similar Ag-Gag measures have been successfully stopped, unfortunately, legislatures beholden to Big Agriculture interests have pushed through similar laws in seven additional states beyond Idaho. This Idaho decision is the first step in defeating similar Ag-Gag laws across the country, and CFS will continue to challenge these laws, too. While much discussion around Ag-Gag laws focuses on animal welfare, the laws also seriously threaten our food safety, by making unlawful investigative activities that could keep contaminated food off the market. 1 in 6 Americans are sickened each year, and thousands tragically perish annually, from ingesting foodborne pathogens – and beef, poultry, and eggs are some of the worst offenders. In May 2015, four Washington State mega-dairies agreed to implement sweeping changes in their operations following a series of successful lawsuits brought by CFS and Community Association for Restoration of the Environment (CARE) against the dairies alleging that their mismanagement of manure contaminated water supplies in the Lower Yakima Valley, Washington community and violated federal environmental law. The settlement followed a January 2015 ruling in the Eastern District of Washington finding that the millions of gallons of manure stored in unlined lagoons and dumped onto crop fields contaminated the soil and aquifer below. Under the terms of the settlement, the dairies will provide clean drinking water to a large number of residents with polluted water and drastically change their operations in ways intended to stop future contamination to the area’s water supply to protect public health and the environment. In October 2013, in response to a lawsuit filed by CFS, the Institute for Agriculture and Trade Policy, and seven other groups, the Food and Drug Administration (FDA) called for the withdrawal of 98 out of 101 arsenic-based animal drugs. And in April 2015, FDA moved to withdraw the last arsenic-based feed additive approved for use in chicken and turkey. We’re going up against the biggest food manufacturers in the world, and we’re winning. But we have more work to do and we must remain vigilant. CFS is part of a coalition of nonprofits currently challenging the Environmental Protection Agency (EPA)’s failure to address air pollution from animal factories that contribute to significant human health problems, including asthma and heart attacks; endanger animal health; intensify the effects of climate change; and cause regional haze and “dead zones” in waterways. CFS is also part of a coalition of nonprofits currently challenging EPA’s 2012 withdrawal of the CAFO reporting rule – a provision of the Clean Water Act that allows EPA to gather basic information on an industry. After initially proposing to collect this information from animal factories, EPA flip-flopped and has refused to do so, under industry pressure. We believe the public has a right to basic data on animal factories, such as location, size, and manure storage methods. Without a transparent system, the public is increasingly vulnerable to the impacts of these facilities. CFS, the Center for Biological Diversity and Sierra Club have also filed a lawsuit against FDA for approving 18 ractopamine-based drugs without examining the environmental and public health risks of their use. Ractopamine is fed to pigs, cattle, and turkeys to cause rapid weight gain. An estimated 60% – 80% of pork sold in U.S. supermarkets comes from pigs treated with this controversial drug. 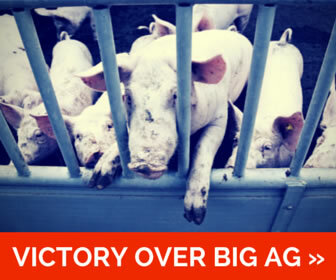 We still have a long road ahead of us to stop these harmful animal factories, but today we celebrate a hard-fought win! 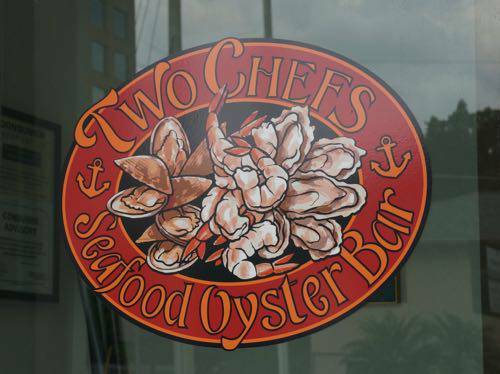 Two Chefs Seafood Oyster Bar is scheduled to open — finally — on Tuesday, April 7, in Orlando’s North Quarter district. The two chefs of the name are Larry Sinibaldi (above left), formerly with Palm restaurant at Hard Rock Hotel, and Bernard Carmouche, who for many years was corporate chef with the Emeril Lagasse restaurants. 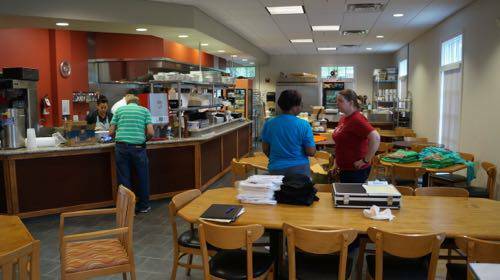 The restaurant occupies a space in a three-story office building that was briefly a coffee shop called Uptown Ground. The original space was expanded and now includes a main dining area with an open kitchen and oyster shucking station, an outdoor seating area with picnic tables, a bar with hightop table seating and rooms upstairs for overflow seating and private events that is accessible through a doctor’s reception area. 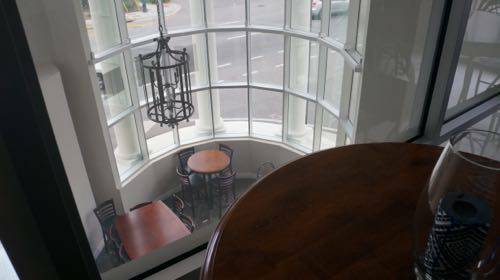 The upstairs dining room overlooks the bar below. 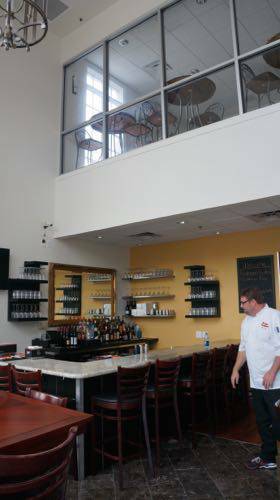 Sinibaldi and Carmouche first announced the restaurant in August and had expected to be open no later than December. However, the expansion, which required a balcony fire escape route for the second floor dining area where none existed and the conversion of an all-electric snack-producing kitchen into a full-service professional one with natural gas, took more time and resources than expected. The restaurant will offer full table service for lunch and dinner, and a full liquor bar. The menu reflects Carmouche’s New Orleans connections with such things as barbecue shrimp, jumbo lump crab cakes, baked oysters and Southern fried chicken. You can see the full menu at the Two Chefs Seafood Oyster Bar website. Whatever secret ingredients are in that finished, packaged product seem to be just plain poison when combined with glyphosate. However, many experts strongly disagree. One of these is Stephanie Seneff, a Senior Research Scientist at the MIT Computer Science and Artificial Intelligence Laboratory. Reportedly, at a recent panel on the topic of genetically modified organisms, Seneff asserted, “at today’s rate, by 2025, one in two children will be autistic.” Autism has been on the increase and no one seems to match the correlation. While this sounds like an outrageously bold statement to make, Seneff apparently had some backup for her claim. At the panel, she displayed data which demonstrated a “remarkably consistent correlation” between Roundup and escalating autism rates. She pointed out that the effects of glyphosate toxicity, and those of autism, are very similar. According to reports, Seneff went on to describe how glyphosate could destroy beneficial gut bacteria in humans, which as we know is essential for proper immune system function. Because of its deleterious effect on healthy gut bacteria, pathogens could be allowed to thrive, and certain nutritional deficiencies could also present themselves. This is also no wonder why scientists and doctors have concluded that yogurt is a daily needed item in our diets. Roundup has also been linked by research to inflammation, cellular damage and an increased risk of multiple cancers. It has also been associated with a higher risk of Parkinson’s and Alzheimer’s diseases. I had a distinct absolution that my cancer was caused by toxic exposure to pesticides. Even though my cancer was ER/PR possitive, I believe that the pesticides change your hormonal makeup. Messing with your estrogen’s, progesterone’s and testosterone’s. A 2014 study published in the journal Chemosphere found that the substance that is created when glyphosate is metabolized by plants and animals – known as AMPA – displayed a, “cytogenetic toxicity which was 1,000 fold higher than that of its parent compound,” in studies. Additionally, another 2014 study, this one published in the Journal of Biomedical Research International, found that Roundup was 125 times more toxic than glyphosate. Whatever secret ingredients are in that finished, packaged product seem to be just plain poison when combined with glyphosate. What is Israel doing in the Medical Marijuana Industry? For over 50 years, medical researchers in Israel have been doing massive amounts of research in the field of cannabis research, particularly in regards to medical use. In the early 1960s Raphael Mechoulam, sometimes called the “Father of Marijuana Research,” and his team established the structure of cannabidiol (CBD) and a year later they isolated and synthesized THC, the main psychoactive ingredient in marijuana. During the 1960s at Weizmann Institute in Rehovot, Israel, Mechoulam was interested in the chemistry and actions of natural products. As there was virtually no contemporary research on the topic, Mechoulam sifted through obscure 19th century medical journals in various languages, primarily French, German and Russian, where he found early works by doctors and medical researchers curious about the plant. However, in the 19th and early 20th centuries, methods to isolate the cannabinoids (a term Mechoulam coined) were very infantry. By the time Mechoulam began his work, liquid-solid chromatography, a chemical separation process method, had undergone significant improvements making it possible to conduct research using much smaller porous particles. During subsequent years Mechoulam and his research team isolated other cannabinoids. His work has served as the foundation for groundbreaking advancements around the world in studying the chemistry of the internal composition of cannabis and how its compounds can be isolated for testing. It was Mechoulam’s early experimentation that first brought to light the benefits of THC in treating nausea from chemotherapy. Other early experiments pointed to the connection of CBD in treating epilepsy, a hypothesis that has been gaining considerable attention in recent years. Superior knowledge in the nutrient industry! Roots are the primary way in which plants acquire nutrients. Plant roots can penetrate to significant depths and are branched so that they can explore large volumes of soil. Some nutrients are only “weakly bound” in the soil, and can flow towards the root surface when a plant uses water. Other nutrients can be tightly bound in some soils, thus, continued uptake by plants relies on growth of roots into new areas of the soil. Root hairs, which greatly increase the volume of soil explored adjacent to the main root and also increase the root’s surface area, may be particularly active in nutrient absorption. The degree of phosphate absorption by soil particles depends on the soil type. Grasses normally have extensive root systems with many fine branches and sub-branches. These features contribute to good soil exploration for nutrients. Other plants have a thick tap-root and relatively fewer fine roots. Legumes form symbiotic relationships with species of soil bacteria and fungi. The bacteria form root nodules and fix nitrogen gas from the atmosphere and provide it in a form suitable for plants. Mycorrhizal fungi form a network of hyphae extending into the soil to facilitate phosphorus uptake. On the other end of things the host plant supplies the bacteria and fungi with sugars fixed through photosynthesis. How is selectivity of nutrient uptake achieved? Mineral nutrients are absorbed by plants from the soil solution as ions. An ion is the charged particle formed by the removal or addition of electrons to any particular atom. The ions have two possible pathways for roots uptake: through the cell walls and intercellular spaces and movement cell-to-cell in the symplasm. The pathway is blocked at the endodermis by casparian bands in the cell walls. These barriers force the water and ions to move through cellular membranes if they are to be absorbed by the root. The casparian bands that block the apoplasmic movement of ions are essential to selectivity since this is achieved by specific ion transporter proteins embedded in the membranes of plant cells. Membranes are composed of a lipid bilayer which prevents the free movement of substances in and out of cells. The transporter proteins are highly specific for the transfer of different ions across the membrane. So, for any given nutrient ion to be accumulated by a plant it must be transported across root cell membranes. Regulation of these transporters enables control of internal nutrient composition and concentrations. Ions absorbed by the roots are then loaded into the xylem and transported with water up to the leaves when the plant transpires.